Now the biggest part of the project is over and most things are done – here you go with the main results. Look at the links to documents and videos! Large carnivore conservation requires a compromise between the needs of wildlife populations and human activities. Therefore in the LIFE EX-TRA project a special effort was made to develop a dialogue between the managing authorities and local communities. Using social science methods, we have identified the most urgent problems and the main interested parties in each country. Whereas in Italy the most urgent problem in protected areas seems to be a feeling of being “not represented” by the authorities, in Romania the main faced issue was the need for a concrete damage compensation system. In Bulgaria most efforts were focused on the mitigation of an emergency situation caused by bears that have attacked humans. In Greece the main problem that was addressed was that the conviction still persists among livestock raisers and hunters that wolves and bears were reintroduced by environmentalist groups. On the basis of the results of this analysis 95 individual or group meetings were held with different types of interest groups – local communities, representatives of local authorities, livestock raisers, hunters, representatives of state insurance etc. – in order to face the main identified issues. In all the project countries there has been a general acknowledgement by the stakeholders that a process was started by the local authorities and NGOs, and that it is ongoing and not a “one-shot” initiative. This has generated an overall improvement of the relationships between stakeholders and the local authorities, and its positive effect for wolf and bear conservation will last beyond the end of the project. 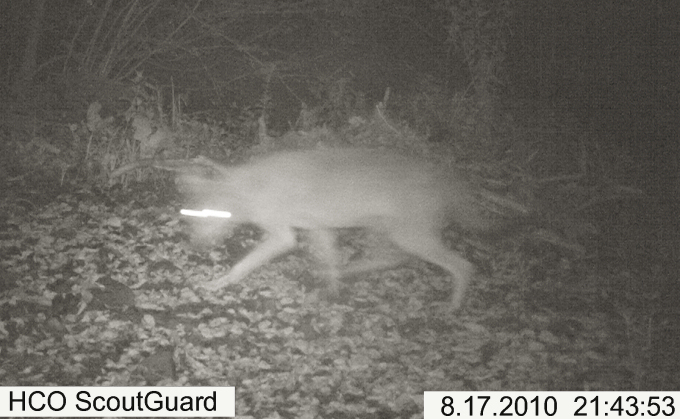 The bear and wolf populations have constantly been monitored throughout the project. The main techniques used were the search of tracks on the snow, wolf howling, collection of scats and fur for DNA analysis and the use of camera traps. Detailed results concerning the distribution and numbers of carnivores in the project areas are now available. Having a healthy ungulate populations is important also for wolf conservation. In fact, since different studies show that where wild prey has been restored wolf predation on domestic animals has been reduced. 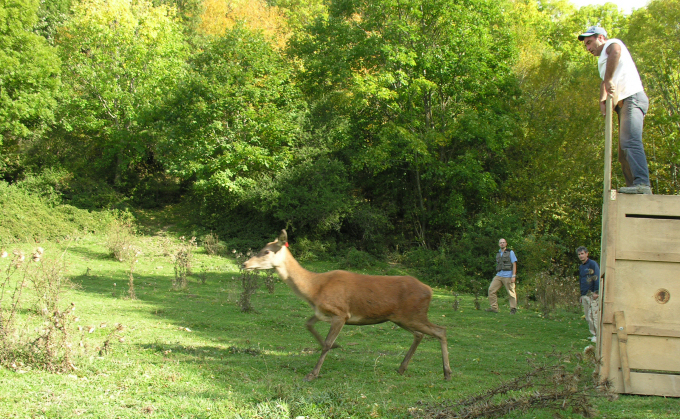 Therefore during the first year of the project an assessment of ungulate densities has been made in Italy (Gran Sasso and Monti Sibillini National Parks) and in the Romanian project area. On the basis of these results management actions have been planned. In Italy the populations have been restocked with 54 red deer. Of these 20 were fit with GPS radio-collars and were remotely monitored. In the same areas visual repellents for ungulates were installed on roads on 58 km to prevent animal-vehicle collisions. In Romania the conservation of ungulates has been supported through the construction of 24 artificial feeding points and two observation points and by the organization of periodical anti-poaching patrols. In this country poaching is one of the main mortality factors for wolf and bear and not only in this country. In the four years of the project ten training courses were organized for local veterinaries and technicians about techniques to assess causes of livestock mortality, to recognize false depredations and about the use of damage prevention tools. Seven stages were held in Italy, one in Bulgaria, one in Greece and one in Romania. The courses have been greatly appreciated. In fact, the numbers of potential participants were always higher than the available places, and therefore more courses than initially foreseen were held. These courses have been coordinated and taught by the veterinary of Gran Sasso e Monti della Laga National Park. An operating manual for predator damage assessment on livestock has also been produced and made available in all project languages. 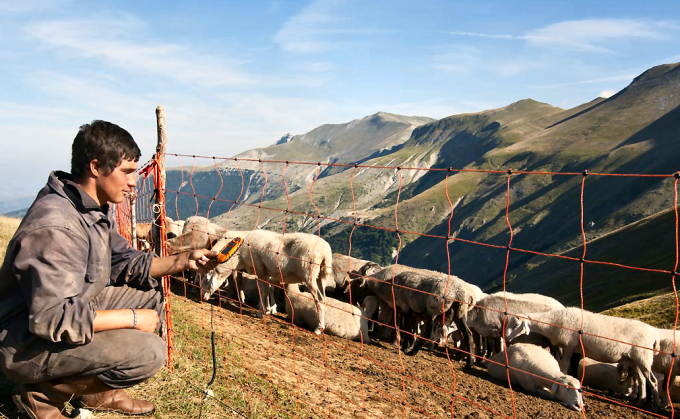 In Monti Sibillini National Park fifteen electric fences have been set up to protect livestock. This resulted in a damage reduction of 67% in the beneficiary holdings. As a consequence of this positive result, and to the great appreciation of the local livestock breeders, the Park administration has decided to co-finance the purchase of additional sixteen electric fences with own funds. 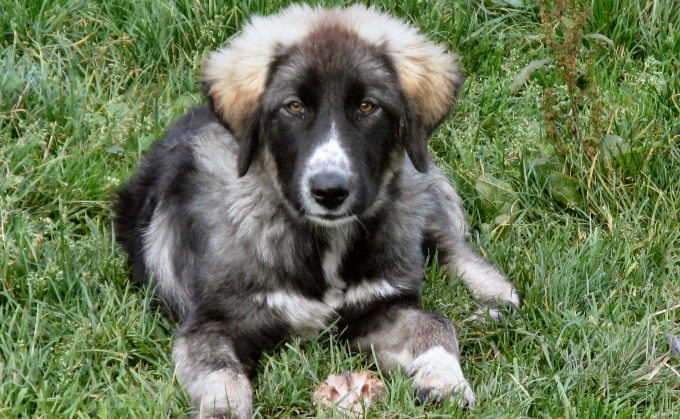 In Romania twelve livestock guarding dog pups (six pairs) were given to farmers. These dogs are growing and future puppies will be given to other local shepherds. In Bulgaria ninety electric fences have been distributed to farmers to protect livestock and bee-hives. This has had an enormous success among the local interest groups. Also, the staff of the Ministry of Environment and Waters (partner of the project) has got aware of the fact that the cost of these tools is lower than the paid damage compensation, therefore they have purchased additional ninety fences with own funds and distributed them in the area. Besides the simple distribution of damage prevention tools the project also aimed to encourage the use of livestock guarding dogs in order to make sure that this will continue also after the end of the project. For this reason in Italy the Gran Sasso e Monti della Laga and the Monti Sibillini National Parks have set up a fruitful cooperation with a local dog breeding association, which is intensively promoting the use of dogs at a wider scale, training shepherds in the use of dogs and selecting high-quality animals. Up to now this network has coordinated the exchange of 61 livestock guarding dogs between shepherds. In Greece the use of livestock guarding dogs has been promoted in cooperation with the LIFE PINDOS/GREVENA Project (LIFE07NAT/GR/000291) and LIFE ARCTOS/KASTORIA (LIFE09NAT/GR/000333). This involved the set-up of a dog breeding centre, information activities for livestock raisers and the exchange of 30 dogs between livestock breeders. In Romania an in-depth information campaign for shepherds about the use of livestock guarding dogs has been carried out in cooperation with local dog breeding associations. In future, the established relationship with livestock guarding dog breeding associations will ease the purchase of dogs for livestock breeders. 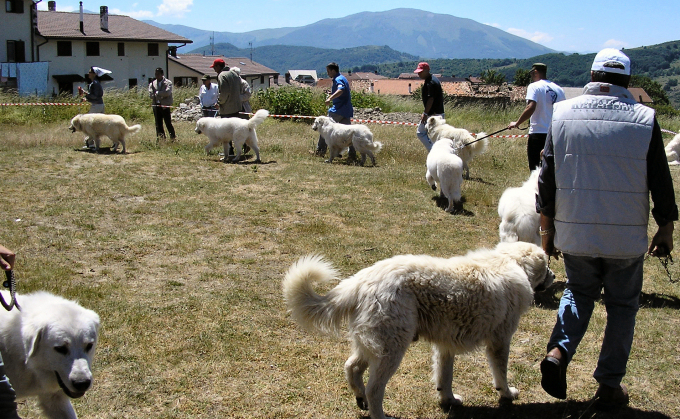 In May 2012 an international workshop was organized in Greece to discuss all relevant aspect about the use of livestock guarding dogs as a damage prevention tool. It was an opportunity to bring together the technicians involved in the work with dogs in the COEX and the EX-TRA projects and to exchange information about the experiences acquired and lessons learned. In all project countries the concept of Bear Emergency Teams has been introduced, with the scope to effectively manage cases in which bears come into conflict situations with human activities. After the organization of initial training stages each country has developed its Bear Emergency Team protocol as a working basis for all the interventions. Specialized teams are now properly equipped are ready to intervene in the shortest possible time in case of need. 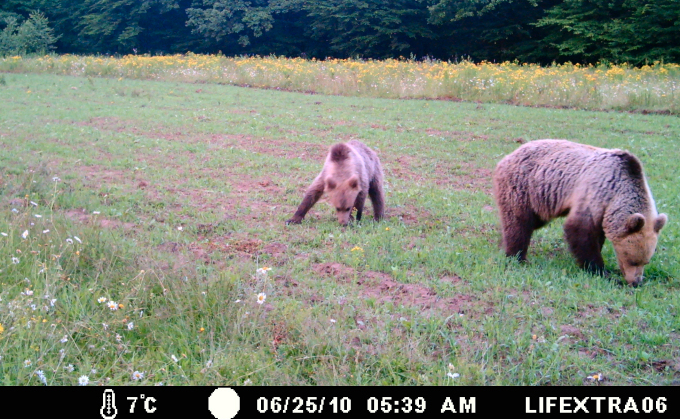 In Italy in the Gran Sasso and the Monti Sibillini National Parks there are no stable bear populations, therefore a Bear Emergency Team has been set up for preventive reasons, in order to have the adequate tools and expertise available in case conflicts involving bears should occur in the area. In Romania the local Bear Emergency Team from ICAS Brasov has made 34 interventions (in which totally 56 bears were addressed). In Greece there have been 30 interventions and in Bulgaria 52. All these were cases in which the alternative would have been the death of a bear either because it was caught in a trap set by poachers or through persecution by humans. Therefore, the project has had a big impact in terms of saved bears. These Bear Emergency Teams are now continuing their activities with own funds and therefore represent extremely important tools in the protection of bears. The entire project has been accompanied by public awareness and dissemination activities. We have produced brochures, posters and an info CD about wolves, bears, livestock guarding dogs and electric fences. These were distributed in schools, in public buildings, at fairs and markets, at meetings with stakeholders and during personal encounters. The project activities have also been presented on more than twenty public meetings, fairs and symposia, which have been visited by several thousand persons. The project results have been also presented in different scientific symposium across the four project countries. 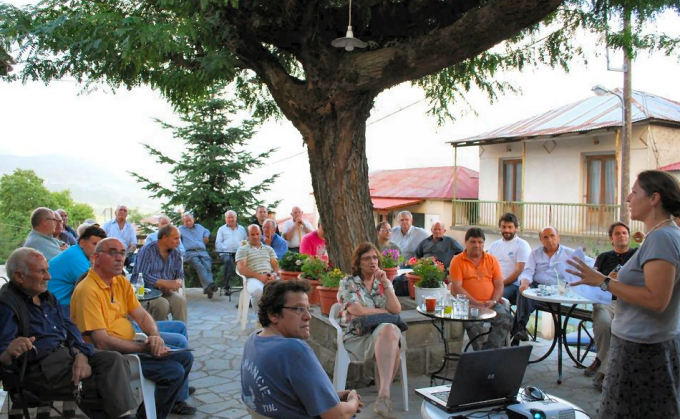 The final conference of the LIFE EX-TRA Project took place in the Gran Sasso National Park in Italy (10-12 October 2012). It was focused on the exchange of best practices in participatory management. The conference was attended by over hundred persons from sixteen countries, and it has made allowed an intense exchange of experiences from many areas of the world. 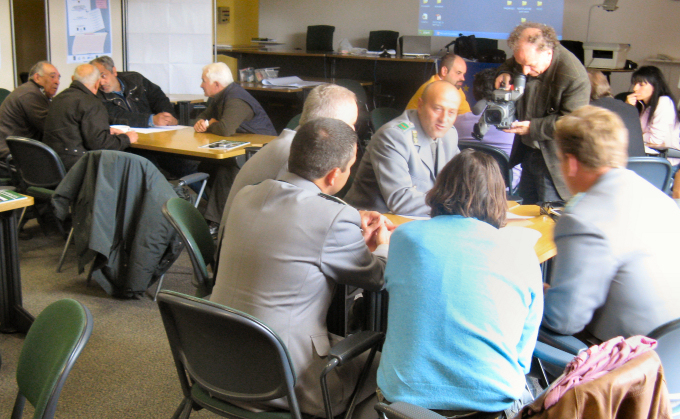 The International character of the project eased an intensive experience exchange between project partners. Nineteen trips have been organized between the different project countries, during which the staff members of the partners had the possibility to learn how specific problems related to carnivore conservation could be solved. Click [pictures of the project activities] to have a look at an excerpt of pictures of the project activities.